In this thoughtful and inspiring memoir, the author of the New York Times bestsellers Reviving Ophelia, The Shelter of Each Other, and Another Country explores her personal search for understanding, tranquility, and respect through her work as a psychologist and seeker. 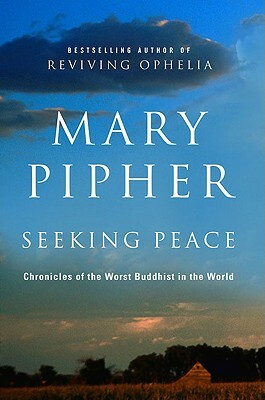 "There are three kinds of secrets," Mary Pipher says in Seeking Peace: Chronicles of the Worst Buddhist in the World. "Those we keep from everyone, those we keep from certain people, and those we keep from ourselves. Writing this book forced me to deal with all three." After decades of exploring the lives of others through her writing and therapy, Mary Pipher turns her attention to herself--culling insights from her own life to highlight the importance of the journey, not just the destination. Like most lives, Pipher's is filled with glory and tragedy, chaos and clarity, love and abandonment. She spent her childhood in small Nebraska towns, the daughter of a doctor mother and a restless jack-of-all-trades father. Often both of her parents were away and Pipher and her siblings lived as what she calls "feral children." Later, as an adult and a therapist, Pipher was able to do what she most enjoyed: learn about the world and help others. After the surprising success of Reviving Ophelia, she was overwhelmed by the attention and demands on her time. In 2002, after a personal crisis, Pipher realized that success and fame were harming her, and she began working to find a quieter, more meditative life that would carry her toward self-acceptance and joy. In Seeking Peace, Mary Pipher tells her own remarkable story, and in the process reveals truths about our search for happiness and love. While her story is unique, "the basic map and milestones of my story are universal," she writes. "We strive to make sense of our selves and our environments." In Seeking Peace, Pipher reflects on her life in a way that allows readers to reimagine theirs. Mary Pipher, Ph.D., is the author of the number-one New York Times-bestselling Reviving Ophelia, as well as The Shelter of Each Other, Another Country, The Middle of Everywhere, and Letters to a Young Therapist. She was a Rockefeller Scholar, and received the American Psychological Association's Presidential Citation. Currently, she is a visiting professor in both the English and Psychology departments at the University of Nebraska.